An adult ESL teacher recounts her frustrating experience of returning to the language classroom in the role of a beginning level learner and outlines four teaching practices that can support struggling adult language learners. I told you many, many times that I understood how difficult it was to learn a new language that was completely different from your first language. I told you that I understood what you were going through and how much you were struggling. I told you that I empathized with your frustration at learning a new alphabet and language system, and that I knew where you were coming from when you teared up during class or called yourself stupid or slow. And I meant every word. I really thought that I understood your experience. I was so very, very, wrong. I had no idea. This. Is. So. Hard. In high school and my first year of college I had muddled my way through Spanish classes, emerging with the ability to discuss food, the weather, and my family in fairly rudimentary terms. I dreaded conjugating verbs and despised the subjunctive tense, and my grasp of syntax was appalling, to say the least. Yet despite my mediocre language learning skills, I somehow found myself in front of an adult ESL classroom in the role of a teacher, and fell completely in love with the work and the learners. Working with literacy-level adult immigrants and refugees was far and away my favorite class to teach. It was us against the English language, and I was sure that I understood their struggles. I always joked that the fact that I was a poor language learner was what made me a strong teacher. When I would teach new skills or concepts, I would ask myself, “what would it take for me to learn this?” While this approach certainly served my learners well in some cases, I didn’t truly realize the depths of some of their struggles. In particular, I wasn’t able to relate to the challenges and frustrations faced by adult learners learning to read and write for the first time in their lives, or learning to read and write in a brand-new alphabet, while functioning in a high-stakes setting. It would take putting myself back into the role of a language student, sitting on the other side of the desk and feeling completely lost and overwhelmed, to cause me to reexamine my long held beliefs about effective classroom instruction for literacy level learners. In 2013, I had the opportunity to join the English Language Fellow program, which is run by the US State Department and places ESL professionals in capacity-building English Education projects at language universities around the world. My husband and I packed up our lives and moved to our new home for the next two years: Phnom Penh, Cambodia. One of the first things that I did once we were settled into our new home was to sign us both up for a Khmer (the official language of Cambodia) as a Foreign Language class at the Institute of Foreign Languages, where I was serving my fellowship. I looked forward to an exciting experience of learning to listen, speak, read, and write in Khmer, which has a writing system originally derived from Brahmi, an ancient Indian script. I anticipated that it would be a steep challenge, but that my past five years of working with literacy level adult learners would serve me well, and that I would be able to bring all of the strategies that I’d developed as a teacher into my new role as a learner. I was confident that I would emerge a stronger literacy-level teacher, and despite my previous poor learning experiences, I was sure that once I started learning a language that I was invested in learning while being immersed in the culture, I would pick it up quickly. Ten minutes into the first day of class and all of my self-confidence had evaporated. The Khmer alphabet appeared to be an indecipherable combination of circles and squiggles, and for the first time I could remember, I wasn’t literate. The class structure and expectations were completely foreign to me. Sitting in the class was like stepping back in time 50 years; the teacher, a sweet elderly man in his 70s, ran classes the same way every night. The teacher wrote on the board, we copied it down in our notebooks. He read aloud, we repeated after him. We would do an exercise in our workbooks, then one-by-one, every student would read the exercise aloud while the teacher sat in front of the room, prompting and correcting pronunciation. He always started with the student on the right-hand side of the front row, and then worked his way back. The first week my husband and I sat in the front row. By the second week I’d moved us back a row to give me more time to prepare before I was called upon to read. By the third week I was trying to get to class early so that we could get a seat in the coveted back row. Even after a couple months of class, copying letters and words of the Khmer alphabet felt as though I were drawing bizarre pictures, rather than writing. My hands would cramp up from how tightly I would hold the pencil and I would have to take breaks and shake them out. The letters blurred together; just when I thought that I had one consonant mastered, the font in the book would change and I’d be completely lost again. 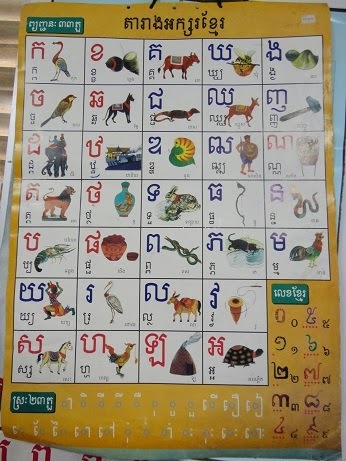 And don’t even get me started on the Khmer vowel system. A simple homework task took forever, and, because of my unfamiliarity with the alphabet, felt like pointless copying. Outside of the classroom, I struggled to identify individual letters on street signs and shop awnings. Sounding words out was a long, laborious process, and often once I’d sounded a word out, I’d realize that I had no idea what it meant due to my small vocabulary. By three months into the class, my fellowship work was piling up and I decided that I couldn’t stand to subject myself to the stress of language classes anymore. After a full day of teaching and lesson planning, while negotiating a brand-new culture and academic system, all I wanted to do was go back to our apartment and collapse in the evenings. I quietly dropped the class and vowed to try and avoid my former teacher around campus at all costs. I found a tutor whom I met with at a coffee shop once a week, and we focused exclusively on spoken Khmer that I would be able to use in daily interactions. When I returned to the United States and stepped back into a literacy-level classroom, I had ample opportunity to reflect on the lessons that could be gleaned from my frustrating language learning experience. Now that I’d had the opportunity to see the classroom from the point of view of a struggling learner, what teaching principles could I identify that might have helped me to be more successful in my language learning? What could I take away from my language learning experience that would help me to become a stronger and more responsive teacher? Some of my beliefs were challenged, and some were confirmed, but the experience certainly impacted how I approach teaching. Described below are four teaching practices that, based on my personal experiences, will now always be central tenets of my classroom instruction. While these four practices have been proven through research to be effective in meeting the instructional and classroom needs of literacy-level adult learners, they could also, as my experience proved, benefit adult learners who are highly literate in their native language, yet struggling in their second language classroom. Teacher, my brain is no good! Lowering the affective filter is critical. Many teachers, myself included, who have worked with low-literacy adult classes have often heard their learners disparage their own learning abilities. It’s also not uncommon to have learners tear up during activities, become so overwhelmed that they stop even trying to participate, or exhibit signs of extreme frustration with themselves in the language classroom. This negative perception of personal capability, in particular when it comes to learning a new language, is not unique to learners who have had limited educational experiences, who have suffered trauma, or who have a specific set of personality characteristics. In Cambodia, I was initially confident in my ability to learn and highly motivated, but my positive attitude quickly morphed into feelings of failure and questioning my own intelligence when I didn’t have any opportunities to experience success. The class moved too quickly for me; the teacher introduced between 5-10 alphabet symbols a night, with very little opportunities for repetition. After a month the workbook had moved into phrases and sentences while I was still struggling to identify the letters. Reading out loud in front of the class was particularly painful; the teacher would correct every little pronunciation mistake that I made until I wanted to sink through the floor with embarrassment. I was taken aback at how frustrated I would become at myself when I struggled in my Khmer class, and how quickly I began to have physical symptoms of anxiety during class, sometimes even before it would begin. Foreign Language Anxiety (FLA) is a documented and researched phenomenon. It’s described as starting as a negative affective response to some experience in language class that, with repeated experiences, develops into an anxiety reliably associated with the language class (Dewaele, Petrides, & Furnham, 2008). A learner who is extroverted, confident and highly motivated may become introverted, anxious, and unmotivated. There is a clear path between FLA and motivation; while high levels of motivation can suppress anxiety, high levels of anxiety can suppress motivation (Gardner & MacIntyre, 1993). It is of the utmost importance that teachers provide their learners with opportunities to experience success with the target language; simply telling them that they are doing a good job is not sufficient. According to MacIntyre, “aptitude can influence anxiety, anxiety can influence performance, and performance can influence anxiety” (1995, p. 95). While this in no way means that teachers must ensure that learners never have a negative experience in their English class, adhering to best practices such as scaffolding language activities, repetition of content and language, and providing opportunities for preparation and rehearsal can alleviate anxiety as well as promote confidence and motivation. Additionally, teachers can help to improve their learners’ self-perception of proficiency through focusing on learners’ successes and positive experiences with the language (Chen & Chang, 2004). Often learners have difficulty recognizing their own growth; they get caught up in their daily struggles and fixated on their mistakes. Teachers can help their learners to remain motivated through providing them with concrete examples of the progress that they are making. Connecting instruction to learners’ lives. In the English classes that I taught, I generally attempted to connect the content of the instruction with the lives of my learners. My learners and I wrote stories about immigrant families dealing with unresponsive landlords, we read notices from their children’s schools, and had conversations about their lives and experiences outside of the classroom. But like most teachers, I would sometimes find myself working with lists of word families that were filled with unfamiliar vocabulary, or would run short of prep time and use a picture story about a penguin wearing a backpack and walking to the market to buy fish. While a busy teacher who used pre-prepared curriculum is by no means a bad teacher, it’s important to realize how frustrating it can be to be asked to learn words and vocabulary that you cannot use outside of the classroom. I very clearly remember sitting in Khmer class and staring down at a page in my class workbook that had us copying out the words for “playing cards” and “bowtie”, which both started with the same Khmer consonant. I did not want to learn those words. I did not need these words. I did not want these words taking up space in my head. I needed that space for important words like “help” and “how much” and “please speak slowly”. In their 2006 article entitled ““What works” for adult literacy students of English as a second language”, Condelli and Wrigley discuss the importance of “bringing in the outside,” or in other words, connecting the content of the class to issues that the learners care about in their lives outside of the classroom. Vinogradov and Bigelow (2010) also emphasize the value of connecting instruction to learners’ lives when working with low-literate adult learners, and offer several recommendations for developing learner-generated texts, such as the Language Experience Approach (LEA) where learners share a common experience and then tell their story while the teacher transcribes what is said, or writing about a picture or a drawing, using dialogue journals, or writing down cultural stories or jokes. Whichever method is used, the power of this approach lies in the fact that the learners will have a personal stake in the language being taught in class, and will have a much greater chance of being invested in learning. As an added benefit, learners will also have a much greater likelihood of using the language being taught in class outside in the community, which will increase their perception of the value of their English class. Multi-level instruction and variety in modalities and activities. Most ESL teachers will agree that there is no such thing as a homogeneous classroom. In my years of teaching ESL, I never once have taught a class that didn’t contain a wide range of language abilities and learning styles. It was not uncommon for my classroom to have learners who had attended post-secondary education sitting next to learners who were learning to read for the first time in their lives. Also, even when learners enter the class at the same language level and with similar educational backgrounds, there are a number of factors such as aptitude, learning style preferences, and investment in learning that can cause wide deviations in developing their target language proficiency. 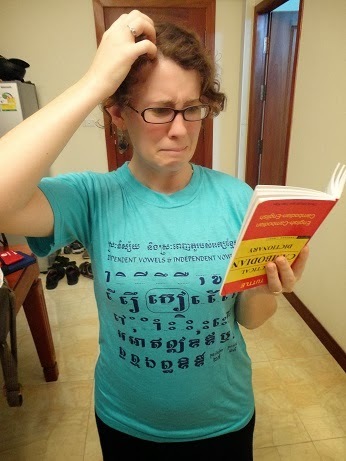 In Cambodia, my husband and I had completely opposite language learning experiences. While I agonized and struggled in Khmer class, my husband excelled. He has a natural ability to mimic accents and sounds, an excellent aural memory, and he found learning the Khmer alphabet to be just like the code-breaking games he loved as a child. Not surprisingly, this sharp discrepancy between our abilities was an endless source of frustration for me. I would have gladly welcomed the opportunity to work on activities at my level that matched my kinesthetic-tactile learning preferences, since attempting to keep up with the class’s rapid speed and lecture teaching style was simply not working. Additionally, having the chance to interact and practice with other Khmer-language learners who were also struggling with the language would have curbed my continuous comparisons between my husband’s progress and my own. One of the key tenets to successful multi-level instruction, particularly at the literacy level, is providing varied practice and language interaction opportunities to ensure that all learners are able to practice and learn in a way that is accessible to them (Condelli & Wrigley, 2006; Vinogradov & Bigelow, 2010). A similar classroom approach is multisensory structured language instruction, which is recommended for at-risk foreign language learners (learners with difficulties or anxiety). This type of explicit and systematic learning of the language includes instruction through all of the modalities (visual, auditory, and kinesthetic-tactile). The resulting slowed down pace of the class and use of scaffolding, varied practice opportunities, and repetition is suited to literacy level learners, and reduces learning anxiety (Chen & Chang, 2004). While it can be tempting for us teachers to keep the class moving ahead at the speed of the fastest and brightest learners, we have a responsibility to provide achievable tasks and targeted instruction for the lowest learners as well. Multi-leveled activities that incorporate the three modalities are essential. In classroom instruction, this may include small group work with appropriately leveled objectives, learning stations, volunteer-led pull-out sessions, and, above all, practice and repetition. Developing vocabulary and oral skills. Thanks to standardized assessment requirements in ABE, a vast majority of which measure only reading and writing skills, there is always a great deal of pressure for teachers to focus a majority of their classroom lessons on print literacy. While the importance of print literacy cannot be overstated, the modalities of speaking and listening should not take a back seat, especially in a literacy-level classroom. 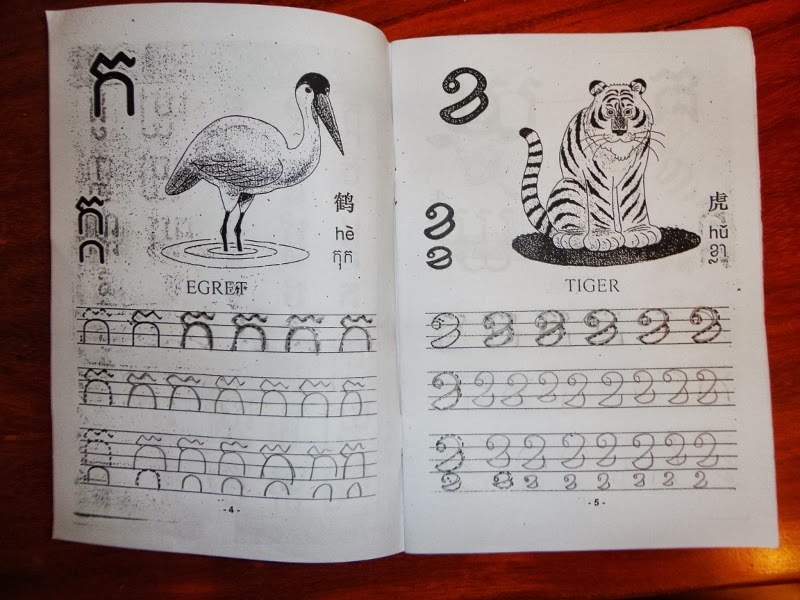 Decoding words in my Khmer class often felt like a pointless and unproductive exercise since I was very rarely familiar with the vocabulary in the workbook. There was no opportunity for me to self-assess or receive the immediate feedback that occurs when a familiar word is successfully sounded out. What I was desperately in need of when I first moved to Cambodia were oral conversation skills so that I could shop for food in the markets, secure transportation around the city, start to make connections with people in my new community, and advocate for myself as a newcomer to the country. The research tells us that for literacy-level ESL learners, emphasizing oral communication skills and vocabulary development helps them to develop a personal resource that they are able to draw on as they become literate. This can have a strong positive impact on the progression of literacy skills (Condelli & Wrigley, 2006; Kurvers, 2007; Vinogradov & Bigelow, 2010). The consequences of attempting to delve into literacy without first strengthening oral skills is stated perfectly by Kurvers (2007), who says “[without] vocabulary development in the second language, reading is like sounding out nonsense words” (p. 41). 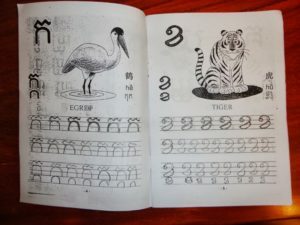 Teachers must give prominence to the development of a vocabulary bank and spoken language, to prepare learners to have success with learning the decoding techniques required in order to read. Literacy level classrooms should be places where learners aren’t afraid to open their mouths and make noise as they find their voices and begin to negotiate meaning and make sense of English. Going back into the language classroom and experiencing language learning from the other side of the desk was an eye-opening experience. Particularly as a teacher, it was humbling to struggle at something that I wanted to excel at, and disheartening to feel that I was making no headway in my language skills. And most powerful of all, it was staggering to realize just how little I’d actually been able to grasp the discomfiture that many of my learners faced every day in their English classes. I had the luxury of being able to choose to leave my Khmer class and find a learning situation better fitted to my needs; my learners have to keep coming back, every day, no matter how frustrated they feel. I will try my upmost to apply the lessons that I learned to my classroom practice as I move forward as a teacher and a trainer. I will do my best to always remember: This. Is. So. Hard. Chen, T., & Chang, G. (2004). The relationship between foreign language anxiety and learning difficulties. Foreign Language Annals 37(2), 279-289. Condelli, L., & Wrigley, H. S. (2006). Instruction, language, and literacy: What works study for adult ESL literacy students. In I. van de Craats, J. Kurvers, & M. Young-Scholten (Eds. ), Low-educated adult second language and literacy acquisition: Proceedings of the inaugural symposium (pp. 111-133). Utrecht, The Netherlands: LOT. Dewaele, Jean-Marc and Petrides, K.V. and Furnham, A. (2008). The effects of trait emotional intelligence and sociobiographical variables on communicative anxiety and foreign language anxiety among adult multilinguals: A review and empirical investigation. Language Learning 58(4), 911-960. Gardner, R. C., & MacIntyre (1993). On the measurement of affective variables in second language learning. Language Learning, 43, 157-194. Kurvers, J. (2007). Development of word recognition skills of adult L2 beginning readers. In N. R. Faux (Ed. ), Low-educated adult second language and literacy acquisition proceedings of symposium (pp. 23-44). Richmond, VA: Literacy Institute at Virginia Commonwealth University. MacIntyre, P. D. (1995). How does anxiety affect second language learning? A reply to Sparks and Ganschow. The Modern Language Journal, 79, 90-99. Ebbinghaus discovered that students forget up to 90 percent of what they learn within a 30-day period. The author argues that implementing the Head-to-Toe Method of Associations for Vocabulary Acquisition is a solution to this age-old problem. From the start, our English language learners (ELLs) are up against the undeniably daunting task of learning a sufficient amount of vocabulary (i.e., single-word lexical items, phrases, and idioms) to be successful in their English-using host culture colleges and universities. Seashore and Eckerson (1940) claimed that native English-using undergraduates have close to 156,000 vocabulary items in their personal lexicon. Lorge and Chall (1963), however, argued that the actual number is more like 39,000. Recent research conducted by Goulden, Nation, and Read (1990) concluded that native English-using university or college graduates know close to 20,000 lexical items. This list, however, does not include phrases and idioms. Perhaps the most inspiring study is the one done by Francis and Kucera (1982); they claim that ELLs can attain a solid understanding of written work if they know at least 5,000 English words. The next task, then, is to identify and categorize what these magical 5,000 words are (McCarten, 2007). This, in itself, is an almost impossible endeavor given that different students demand different lexical items. What each student needs depends on their level of study and what their field of study is. Suffice it to say, our students need to study vocabulary, and we need an effective and efficient method to help them learn. To make matters worse, there is something I call the Ebbinghaus curse. In 1885, Hermann Ebbinghaus made a significant and, at the same time, discouraging discovery: We forget approximately 90 percent of what we learn within a 30-day period. To add insult to injury, he also discovered that the majority of this forgetting happens during the first few hours after the initial encoding and learning of the material take place (Ebbinghaus, 1885/1913). So, given that our students need such a large number of lexical items to successfully survive at the college level, and given they will, according to Ebbinghaus, forget up to 90 percent of these once exposed to them, is there really any purpose in teaching vocabulary? Younger instructors in the profession are also dismayed when they read Krashen (2012), who claims that “direct instruction cannot deal with the size and complexity of vocabulary learning” (p. 33). In addition, vocabulary pedagogists, like Paul Nation, have given interviews claiming that it is a waste of time to teach vocabulary. Krashen and Nation do have a point, for students need a vast amount of vocabulary, and, if the students will forget 90 percent of these terms, then perhaps there really is no need to teach vocabulary. I, however, politely disagree based on the development of my own vocabulary teaching method I call the Head-to-Toe Method of Associations for Vocabulary Acquisition. I argue that, although instructors cannot teach the needed 5,000 lexical items in a semester, by using the Head-to-Toe Method, they can (1) break the daunting Ebbinghaus curse (McPherron & Randolph, 2014), and (2) help students develop a surefire method that they will be able to use on their own to help acquire the needed vocabulary. The Head-to-Toe Method of Associations is a flexible and creative method based on establishing as many neural pathway connections as possible during the encoding process to facilitate and strengthen the language learners’ long-term retention of English lexical items. These connections are also reinforced through a number of neuroscience- and humanistic-based associations that are elicited during the storage and retrieval processes. Repetition of these associations and the terms’ meanings and usages also play a central role in the method. The pivotal reason why I think this method has been so successful and why my students and others (G. Almeida-Alves, personal communication, January 20, 2016; C. Hart, personal communication, May 17, 2014) feel it works, rests on the fact that the method is focused primarily on eliciting connections based on the students’ personal histories, and it pulls from their emotional associations and memories. This helps transform abstract lexical items into more concrete and personal ones. So, the students feel an immediate ownership and relation to the terms that are studied. In fact, one could figuratively claim that 90 percent of the method is student-generated and 10 percent is teacher-generated. The Head-to-Toe Method contains up to 40 effective components (e.g., see Randolph, 2015, regarding the word-personality activities), although not all, of course, are used at one time. The various components are implemented at different times in the process. Some components, depending on the level, interest, and ability of the students, can be selected and others bypassed. The method is essentially a large toolbox—an instructor can pick and choose what he or she feels is necessary. The Head-to-Toe Method can be likened to the structural dynamics of a spider web. The strength of a spider web, according to MIT’s David L. Chandler (2012), is the unique characteristics of “the material’s unusual combination of strength and stretchiness—silk’s characteristic way of first softening and then stiffening…” (para. 1). There is also the complex design that reinforces the web and supports it—even against devastating, hurricane-like winds. The design keeps it intact and ready to capture the spider’s prey (Chandler, 2012). The Head-to-Toe Method is much like the spider web because of the vast number of student-elicited connections that form an intense “neural webbing of connected associations” (Randolph, 2015a, para. 4). Each personal association made during the all-important moment of encoding (Medina, 2009) helps forge an active connection between a set of neurons, thus fostering a deep understanding of the vocabulary item and helping to transfer it to the students’ long-term memory. The more connections and associations that develop, the stronger the memory becomes as it holds the vocabulary term in its “silky” webbing. The Ebbinghaus curse is an undeniable reality (Ebbinghaus, 1885/1913; Medina, 2009; Sousa, 2011), but this does not mean it always happens or has to happen. The Head-to-Toe Method has consistently broken the curse through the use of its key components. When I evaluate my ELLs with pop quizzes/tests—weeks and sometimes months after first teaching the terms—my classes average an 88 percent to 98 percent retention rate of the vocabulary terms. These quizzes require students to define the terms correctly and use them in original example sentences (Randolph, 2015b). As above, I mentioned the method consists of 40 components, but neither time nor space allow me to detail all of these; I will, however, briefly explain the main components or tools and then go over the procedure I use during a week of lessons. I would like to note that I do not teach a class solely devoted to vocabulary. The courses I teach are focused on academic presentations, critical reading, or academic writing. In each of these classes, I designate the first 15-20 minutes to vocabulary. I mention this because I feel it’s important for other instructors to realize they do not need a whole class to effectively teach vocabulary; but rather, they can use their warm-up time to help students acquire both the terms and the tools for steering them in the direction of self-learning. The following tools are the essential parts of the framework I use to teach vocabulary. According to prominent educators (Jensen, 2008; Sousa, 2011; Willis, 2006) and neuroscientists (Biswas et al., 2015; Medina, 2009; Ratey, 2010), physical exercise is the essential ingredient that makes all learning possible; it provides oxygen to the brain, elicits multiple learning-based neurotransmitters like epinephrine and acetylcholine, releases proteins in the brain like brain derived neurotrophic factor (BDNF), strengthens existing neural-connections, and helps create new neurons (neurogenesis) for more learning (Ratey, 2010). A series of studies done in Germany (Schmidt-Kassow et al., 2013; Winter et al., 2007) showed how exercise before and during the encoding of vocabulary increases the chances of long-term retention of the lexical items. Ebbinghaus (1885/1913) discovered that although we can and often do forget up to 90 percent of what we learn within 30 days, this does not have to be the case. He explained that if we repeat and review the newly acquired information and re-expose ourselves to it at spaced-out intervals during the hour, day, or week, we can break the curse. Medina (2009) supports this claim. “Memory’, he states, ‘may not be fixed at the moment of learning, but repetition, doled out in specifically timed intervals, is the fixative” (p. 130). Verbpathy (verb=word; pathy= feeling) is a concept I created and use to describe how students begin to intuitively “feel” the deeper meanings, registers, and usages of words. It also introduces them to the emotional value of words. Neuroscientists such as Damasio (2000) and Willis (2006) have discovered that emotions are central to learning, and anytime we can incorporate an emotional connection to learning, there is a greater chance we have of making the learning last through a webbing of intense neural activity in the amygdala and cerebral cortex. Synesthesia is a neural condition in which there is a crisscrossing of the senses so that they actually produce a different perception or experience from their normal function; e.g., synesthetes might “taste colors,” “hear colors,” “smell sounds,” or “taste shapes.” Cytowic and Eagleman (2011) have reported that one very positive attribute of synesthetes is their excellent long-term memory. Drawing from this, I incorporate the senses in my Head-to-Toe Method, for it helps the students create a multiple-neural connection experience with words and senses, and it helps weave together multiple personal associations with a single lexical item. It is a fact that “Our senses evolved to work together—vision influencing hearing, for example—which means that we learn best if we stimulate several senses at once” (Medina, 2009, p. 219). The use of embodied semantics is a relatively new component of the Head-to-Toe Method. Here, I have students associate the lexical items with the body. For instance, “shed light on” could be associated with “the mouth,” “the brain,” or “the hands,” as these help us “explain” things clearly. According to neuroscientists, Aziz-Zadeh and Damasio (2008), the concept of embodied semantics rests on the framework that language concepts “are represented in the brain within the same sensory-motor circuitry in which the enactment of that concept relies” (p. 1). When someone says and hears “kick the ball,” the brain deploys the same motor neurons that are used when one actually kicks a ball. The idea is the body and brain work as one. For a review of the current week and previous weeks’ terms, I get the students to pair up and quiz or “reteach” each other about the terms. The idea is that I want them to command a teaching role and have authority over the terms. This also buys into the repetition and spaced-out interval technique. Moreover, I feel the more my students talk about the terms, explain them, and look at them from a teacher’s perspective, the more they will learn and remember them. Craik and Lockhart (1972) argued for a similar idea that looked at elaborate ways to process information with greater “depth or levels of processing” (p. 671). According to their work, “Only deeper processing will lead to an improvement in memory” (p. 681). They showed that the more elaborate ways one examines something, the deeper their learning becomes. Before going over the Head-to-Toe Method’s procedure, I’d like to point out some important caveats. As I mentioned above, there are a vast number of components in this method. Not all, of course, are imperative for the encoding process nor are they necessary for one lesson. The two primary reasons I have so many tools are (1) different tools can be used at different stages of acquisition (i.e., the encoding, retrieval, and usage stages), and (2) the tools give each instructor an opportunity to try what best fits their own unique style, psyche, and comfort zone. In this sense, the method supports Kumaravadivelu’s postmethod approach to teaching (2006). In addition, it allows instructors to use the components that fit best for a particular group of students. In the following section, I will focus on the “core components” I use for every lesson. These are considered “core components” primarily because of their proven effectiveness and because the students in my Intensive English Program and English language university credit classes have defined them as “essential” for their learning outcomes. I would also like to point out that the core components should not necessarily be used all at once when first trying the method. I recommend that instructors implement one and then, when they feel comfortable with expanding their repertoire, add the next component in the procedure (Randolph, 2014). Now, let us take a look at how the method unfolds. I always start each lesson with a few minutes of physical exercise. Before doing these exercises, however, I always give students the option to either participate or decline. Since I’ve implemented and promoted class exercises before and during the lessons, I have had a 99 percent participation rate. Students not only quickly see the benefits, but they enjoy doing the exercises as well. The point of these exercises is to elevate the heart rate and increase blood flow and oxygen to the brain. The exercises I use range from running in place, doing a timed hall walk, or tai-chi-like exercises. The third aforementioned activity can be seen in the video below. The students are given a worksheet with the same information on it. Each vocabulary sheet consists of five terms. In addition to the written example on the board and on their worksheets, I give them two or three more spoken example sentences. The students are usually quick to infer the meaning and give me the definition. I may help them craft the standard definition of the term, but I never dictate it to them or give it outright. And, as this is a class activity, all the members become engaged in forming, learning, and confirming the correct definitions of the terms. This Socratic approach helps in the encoding stage for a number of reasons: First, when they formulate the definitions themselves, there is the immediate feeling of personal involvement, contribution, and ownership. I am not telling them what the definition is, they are telling me. This, in itself, ignites that first needed electrical flash between neurons to start the encoding process. Second, the fact that the students and I are using the term multiple times in an isolated time frame (15-20 minutes) reinforces the key components of repetition and spaced-out intervals. Third, the emotions, interest, and attention are piqued because I use the students’ names, hobbies, and personal or cultural background histories in the example sentences. This use of student information elicits immediate emotional value and connections to the terms, and thus, employs the highly important amygdala—the brain’s center for emotional learning and emotional memory (Medina, 2009). In fact, a student recently commented that a major problem with many dictionary examples is that they have no or very little, at best, relation to the ELLs’ lives. She likes the Head-to-Toe Method because of the immediate, personal, and engaging examples on the worksheets and ones given by me and her classmates during the lesson. Once the definition is addressed, we go over the part of speech (in the case of our example, “shed light on,” we could classify it as an idiom functioning as a verb group), and then we turn to the term’s verbpathy. Verbpathy entails that the students assign a positive, negative, or neutral “feeling” to the term and explain why they feel it is so. Verbpathy can include a general cultural feeling and a personal one. This often makes for lively debate and truly gets the ELLs to relate to the terms at a deeper level. “Shed light on,” of course, would elicit a positive feeling because it “clarifies” or “makes something clear.” At this point, when necessary, I also go over possible registers of the term—when, where, and with whom it can be used. “green” was the favorite color of his high school history teacher, who happened to explain everything very clearly. The fact that the student personalized the term with his own life’s history set up multiple cultural, personal, and historical connections with the item in his brain’s neural-webbing. After I elicit the colors from the students, I move on to the term’s emotional associations and ask what emotion or emotions the term evokes or represents. For example, “shed light on” often evokes the feelings of “happiness,” “interest,” “comfort,” and “surprise.” Students have also responded with associations such as “excitement,” “curiosity,” “confidence,” and “pride.” Each of these, they claimed, connects to the meaning of making something clear or being satisfied with a good explanation. The last major association we cover is the body association. Here, I ask the students what body part they feel best represents the term in question. While recently studying “shed light on,” my students felt that the “brain,” “hands,” and “arms” symbolized the best correlations with the idiom. Their reasoning was based on the idea that we use these parts to clarify ideas on both conceptual and physical levels; the brain reasons out what is clear, and the arms and hands add to this with physical gestures that help create “picture-like” images that define the term. After we wrap up the part of speech and the four essential associations, I ask the class to give original example sentences using the terms. Their examples are often unique, humorous, classmate-related, and personal, so they resonate with the whole class. This experience is what my student, mentioned above, recently voiced when she juxtaposed the common dictionary examples with the ones generated in our classes. This whole experience reinforces the sense of word ownership and creates an immediate personal relation to the words. The examples also allow the students to both say and hear the new terms multiple times, helping to strengthen an understanding of the items during the all-important encoding process. Here again the notion of the spaced-out intervals of repetition comes into play. The students will see, hear, and maybe even use terms up to 8-10 times within a mere 15-20-minute period. Add the time they study on their own in the evenings, and they will create a solid connection among their neurons. Finally, the vocabulary items of the current week are additionally reviewed in two ways. First, the students complete the above mentioned worksheet that requires them to create original example sentences for each term; and second, the warm up for the last class of the week gives the students an opportunity to pair up and review the weekly terms’ definitions and create new example sentences. This is where they get to teach and explain or talk about the terms, implementing Craik and Lockhart’s elaborate or “deeper processing” (p. 681). Although the Ebbinghaus curse is a reality, it does not necessarily need to haunt all English language teachers; the curse can be broken. For five years, I have collected data showing an extremely high retention rate of the taught vocabulary. By using pop quizzes/tests (another key element of the method), I have helped my students score anywhere between 88 to 98 percent as a class. For example, a recent class took four pop quizzes/tests during the course of the semester. The class results (N=15) were 91.3, 93.2, 98, and 93.6 percent. The overall average of these was 94 percent. Moreover, my former students have also reported that they have found the method useful to use for both their own studies and for their own students (for those who are teachers) when they return to teaching in their respective classrooms. I attribute the success of the method to the fact that I am engaging my students to make these terms a part of their lives through developing and fortifying unique connections and creative associations that penetrate the essence of who and what they are. The method allows students to see that their perceived self-worth and personal history are the keys to acquiring the lexical world they need to survive at the university and beyond. Craik, F.I.M., & Lockhart, R.S. (1972). Levels of processing: A framework for memory research. Journal of Verbal Learning and Verbal Behavior, 11, 671–684. Damasio, A. (2000). The feeling of what happens: Body and emotion in the making of consciousness. Orlando, FL: Mariner Books. Francis, W.N., & Kucera, H. (1982). Frequency analysis of English usage. Boston, MA: Houghton Mifflin Company. Goulden, R., Nation, P., & Read, J. (1990). How large can a receptive vocabulary be? Applied Linguistics, 11(4), 341-363. Jensen, E. (2008). Brain-based learning: The new paradigm of teaching. Thousand Oaks, CA: Corwin Press. Krashen, S. (2012). Reading and vocabulary acquisition: Supporting evidence and some objections. Iranian Journal of Language Teaching Research, 1(1), 27-43. Lorge, I., & Chall, J.S. (1963). Estimating the size of vocabularies of children and adults: An analysis of methodological issues. Journal of Experimental Education, 32, 147-157. McCarten, J. (2007). Teaching vocabulary. New York; NY: Cambridge University Press. McPherron, P., & Randolph, P.T. (2014). Cat got your tongue? : Recent research and classroom practices for teaching idioms to English learners around the world. Alexandria, VA: TESOL Press. Randolph, P.T. (2014). Breaking the Ebbinghaus curse for vocabulary acquisition with the R.E.S.T. method. The Selected Proceedings of the 2013 MITESOL Conference, 66-75. Randolph, P.T. (2015a). Getting physical: Making connections between the body and vocabulary. CATESOL News Quarterly (47) 3. Randolph, P.T. (2015b). Breaking the Ebbinghaus curse: A guaranteed technique for vocabulary acquisition. The 49th Annual TESOL Convention and English Language Expo, March 25-28. Best of the TESOL Affiliates Session. Toronto, Canada. Ratey, J.J., & Hagerman, E. (2010). Spark! How exercise will improve the performance of your brain. London, England: Quercus. Seashore, R.H., & Eckerson, L.D. (1940). The measurement of individual differences in general English vocabularies. Journal of Educational Psychology, 31(1), 14-38. Sousa, D.A. (2011). How the brain learns. Thousand Oaks, CA: Corwin/Sage. Willis, J. (2006). Research-based strategies to ignite student learning: Insights from a neurologist and classroom teacher. Alexandria, VA: Association for Supervision and Curriculum Development. Winter, B., Breitenstein, C., Mooren, F.C., Voelker, K., Fobker, M., Lechtermann, A., Krueger, K., Fromme, A., Korsukewitz, C., Floel, A., & Knecht, S. (2007). High impact running improves learning. Neurobiology of Learning and Memory, 87, 597–609. L2 speaking anxiety can be debilitating to some learners. This article explores research and suggests possible methods and teaching practices to move toward more valid assessment of L2 learners who experience this feeling. Albeit strongly motivated and sincerely interested in learning a second or foreign language, many learners express having a ‘mental block’ in their learning that prevents them from succeeding in the second language (L2) classroom (Horwitz, 2001; Horwitz, Horwitz, & Cope, 1986). In many cases, this may be due to a feeling of anxiety concerning L2 learning. Anxiety is the subjective feeling of worry, nervousness, or unease that comes with an event or something with an unsure outcome. When this feeling is limited to certain situations (e.g. language learning), psychologists further delineate this phenomenon into the category of ‘specific anxiety reactions’ (Horwitz, et al., 1986), in order to distinguish between those who may feel constant anxiety and others who feel anxious in specific situations. Regarding specific anxiety reaction in language classrooms, educators could help to allay this barrier in L2 learning. Several studies have looked at the relationship between anxiety and L2 learning under varying physical and social conditions to determine how consequential this issue is in L2 classrooms (e.g. Cheng, Horwitz, & Schallert, 1999; MacIntyre & Gardner, 1994; Phillips, 1992; Sellers, 2000; Woodrow, 2006). Sellers’ (2000) study on the relationship between anxiety and reading comprehension in Spanish found a direct correlation between university-level students’ feelings of anxiety and the amount of content information they were able to recall after reading. Their anxiety had an effect on the reading process itself as well. In another study, Cheng et al. (1999) investigated the link between L2 writing anxiety and general L2 classroom anxiety and found a visible difference between the two types and their effects. This suggests that specific language skills (e.g. writing) can have different effects on students’ anxiety. While Cheng et al. (1999) found this to be true for writing, the same may be said for other language skills, such as speaking. Following the shift away from behaviorism in second language acquisition (SLA) and rote memorization and drilling in L2 learning, teaching practice began to focus more closely on (oral) communicative proficiency and conversational exchange in the language classroom (Brown & Lee, 2015a). Now, in the Communicative Language Teaching (CLT) era, second and foreign language classrooms place a stronger emphasis on fostering communicative competencies and require more L2 speaking and listening practice of the students. This article explores L2 speaking anxiety in the classroom through current research and suggests possible methods and teaching practices to move toward more valid assessment of L2 learners who experience this debilitating feeling. It is well known that speaking or reading out loud in front of others can have a certain effect on some individuals’ performance. While this might result as a sense of nervous flutters for some, this could manifest as paralyzing stage fright for others. Previous studies have suggested a strong link between speaking anxiety in a learner’s first language (L1) and speaking anxiety in the L2 (MacIntyre, Noels, & Clément, 1997). However, the amount of anxiety generated by speaking in the L1 and L2 is more than likely not the same; speaking anxiety may intensify in the L2 due to many other reasons such as low-confidence and limited knowledge of the language. Concerning the four different language skill areas (reading, writing, listening, and speaking), speaking has been shown to be the most problematic for learners of a second or foreign language with regard to anxiety (Horwitz, et. al, 1986; Phillips, 1989, 1992; Scott, 1986). While many students indicate interest in improving their L2 communication skills, speaking anxiety may prevent them from achieving this goal (Lindenau, 1987, as cited in Phillips, 1992). In addition to speaking anxiety, research suggests that tests and assessments increase learner anxiety as well (see Tobias, 1980, as cited in Phillips, 1992). The combination of the two, thus resulting in oral language assessment, may be then considered one of the most anxiety-inducing situations that can occur in a second language classroom. In Woodrow’s (2006) study of the anxiety levels of second language learners of English, she looked at the relationship between anxiety and second language performance on tests. The participants in her study were advanced-level students in an English for academic purposes (EAP) program who had been accepted to enter into various Australian universities. Given the nature of the EAP students and their admission into higher education in a primarily English speaking country, it is assumed that they were motivated to do well on this speaking performance assessment. Measuring the self-reported anxiety levels of 275 advanced-level EAP students and then aligning those measures with oral performance results, it was determined that anxiety was a high indicator of how well students performed on oral tests. In other words, the higher the students’ anxiety, the lower their performance scored. In addition, students reported what factors caused them to be most anxious in speaking. The most frequently cited source of anxiety was speaking with a native speaker of the target language (English) during the assessment. Therefore, in addition to speaking in the L2 and being assessed, interaction with a native speaker in that context seemed to further raise students’ anxiety levels. With such (at times) overwhelming student anxiety, how can language educators be confident that their practices in L2 oral assessment are indeed assessing what they claim to assess? In other words, by not factoring in the debilitating effects of L2 speaking and oral assessment anxiety, can educators really be certain that their assessment practices are valid? Is a student’s expression of his or her authentic knowledge in the content area or language being assessed, as supposed? Or, is it rather the performance itself in an arguably high-anxiety situation that counts for the total of the student’s oral grade? Anxiety can skew assessment results, so it should be considered when determining final L2 speaking scores. By not allaying or attempting to reduce the anxiety-inducing factors that studies have suggested, L2 speaking assessments cannot truly be considered a valid indicator of students’ performance in a second or foreign language. Regarding students’ attitudes toward assessment, studies have indicated certain preferences between anxious and non-anxious learners. For example, Birenbaum and Feldman (1998) examined the relationship between learning patterns and certain assessment formats (open-ended and close-ended questions) among students in higher education. The results of their study found that low-anxiety (i.e. confident) learners preferred open-ended questions in assessment, whereas high-anxiety (i.e. less confident) learners preferred close-ended questions. While the study’s results are not surprising, what can be accomplished with that information may be less obvious. Educators might attempt to move from close-ended, controlled techniques toward more open-ended possibilities in their teaching practice. Below is an abridged taxonomy of language-teaching techniques (originally adapted from Crookes & Chaudron, 1991, p. 52-4, as cited in Brown & Lee, 2015b, p. 226-7) that moves from controlled techniques to open-ended techniques for L2 speaking. 1. Warm-up: Mimes, dances, songs, jokes, play. This activity gets the students stimulated, relaxed, motivated, attentive, or otherwise engaged and ready for the lesson. It does not necessarily involve use of the target language. 2. Content explanation: Grammatical, phonological, lexical (vocabulary), sociolinguistic, pragmatic, or any other aspects of language. 3. Role-play demonstration: Selected students or teachers illustrate the procedure(s) to be applied in the lesson segment to follow. Includes brief illustration of language or other content to be incorporated. 4. Dialogue/Narrative presentation: Reading or listening passage presented for passive reception. No implication of student production or other identification of specific target forms or functions (students may be asked to understand). 5. Dialogue/Narrative recitation: Reciting previously known or prepared text, either in unison or individually. 6. Reading aloud: Reading directly from a given text. 7. Storytelling (student-generated): A lengthy presentation of story by a student (may overlap with Warm-up or Narrative recitation). May be used to maintain attention, motivate, or as lengthy practice. 8. Question-answer, referential: Activity involving prompting of responses by means of referential questions (i.e. the questioner does not already know the answer beforehand). 9. Cued narrative/dialogue: Student production of narrative or dialogue following cues from miming, cue cards, pictures, or other stimuli related to narrative/dialogue (e.g. metalanguage requesting functional acts). 10. Role-play: relatively open-ended acting out of specified roles and functions. 11. Report: Report of student-prepared exposition on books, experiences, project work, without immediate stimulus, and elaborated on according to student interests. 12. Drama: Planned dramatic rendition of play, skit, or story. 13. Interview: A student is directed to get information from another student or students. 14. Discussion: Debate or other form of grouped discussion of specified topic, with or without specified sides/positions prearranged. 15. A propos: Conversation or other socially oriented interaction/speech by students, on general real-life topics. Moving along this spectrum toward the most open-ended tasks could lead learners into a more confident state as they build upon past L2 speaking experiences and become less anxious in class. By reducing the effect speaking anxiety has on particular students, oral assessments may be considered more valid. In another study, Cassady and Gridley (2005) analyzed the effects of online formative and summative assessment materials on students in higher education with specific attention to their testing behaviors (i.e. performance and study habits) and beliefs (i.e. anxiety or ‘perceived threat’). What the researchers found was that there were no negative effects of online testing reported; performance results were comparable between both online assessment and paper-pencil assessment. However, Cassady and Gridley did find that perception of the test itself differed in terms of how anxious students were in taking the test. In fact, students taking online tests for both formative and summative assessments reported lower levels of anxiety and perceived test threat. Results from this study therefore advocate for use of technology in the L2 classrooms with respect to assessment as this may diminish the anxiety of test-taking some students feel subjected to. Nevertheless, it is true that while students may feel less anxious while interacting with technology, this may not show their level of social competence in using English with other speakers. While that may be the case, it is important to take into perspective the objectives in the L2 classrooms and what the instructor is aiming to assess. If the objective is to use English to give an oral presentation, then assessing the student by having him or her give a presentation in front of the class remains an important element to meet that objective. But, if the language objective is not rooted in social context, then placing the student in an anxiety provoking situations may be unnecessary and result in less valid assessment. Self-enhancement comes from the need to improve one’s own self-perception and self-worth (MacIntyre et al., 1997). As individuals respond to the need to see themselves in a more positive manner, they may become overly optimistic. While this might not be as beneficial for assessment of all learners, others have argued that this bias helps during the acquisition of new skills because “it provides the impetus to invest the extra effort needed to confront a challenging obstacle” (p. 269). Self-derogation, on the other hand, refers to a systematic underestimation of one’s abilities. This is common among anxious or depressed learners who have little faith in their own abilities as well as little agency in their learning. Although this appears quite negative, previous quantitative and qualitative studies (see MacIntyre et al., 1997 for a short review) have reported that this bias may be helpful in preparing learners to defend against loss in self-esteem in the event of a failure in language production. By not being over-confident that he or she would succeed, the learner may be less devastated to learn that a mistake has been made. Of course, in moving toward self-assessment, the instructor would have to lead students to a compromise between the two biases in order to obtain accurate perceived competence and thus a valid assessment of students’ performance. Self-assessment can help make learners more active. Self-assessment can help learners realize they have the ultimate responsibility for their own learning. Self-assessment provides individual focus; learners focus on their own strengths and weaknesses specifically. Self-assessment allows students to see their learning in personal terms. As earlier research has also suggested, learners are most often able to accurately self-rate their abilities and “there is consistent overall agreement between self-assessment and rating based on a variety of external criteria” (Blanche & Merino, 1989, p. 315, as cited in MacIntyre et. al, 1997). Therefore, with minimal established negative factors of self-assessment, instructors may also incorporate this valid assessment practice into their L2 speaking classrooms. Language instructors may choose a slow transition toward self-regulation and learner autonomy through gradual implementation of self-assessment in their teaching practice. Starting with simple checklists and ‘can do’ statements, the instructor can establish a precedent of self-assessment practice in the classroom and learners will begin to gain direction from there. The purpose of self-assessment should be made aware to learners, emphasizing specifically how this tool can greatly benefit their own learning. By scaffolding these individual self-assessments with support and rationale, students will take the assessments more seriously and they will thus be more effective. This article discusses L2 speaking anxiety in the classroom by exploring relevant research. It also suggests possible methods and teaching practices to move toward more valid assessment of L2 learners who experience this debilitating feeling. In accordance with the increased emphasis on spontaneous oral production and L2 speaking assessment in second and foreign language classrooms, reducing learners’ speaking anxiety is important for valid assessment of speakers’ communicative competence. L2 speaking anxiety can be allayed by knowledgeable instructors who recognize the effects of anxiety and work with students to reduce its presence in second language learning. Possible means of reducing anxiety in the L2 classroom are moving from more close-ended techniques toward more open-ended possibilities, utilizing technology and online forms of both formative and summative assessment, and moving toward self-regulation and ultimately learner autonomy through self-assessment practice. Blanche, P., & Merino, B. (1989). Self-assessment of foreign-language skills: Implications for teachers and researchers. Language Learning, 39(1), 313–40. Birenbaum, M., & Feldman, R. (1998). Relationships between learning patterns and attitudes towards two assessment formats. Educational Research, 40(1), 90-98. Brown, H., & Lee, H. (2015a). A century of language teaching. In Teaching by principles: An interactive approach to language pedagogy (4th ed.). (pp. 14-38). White Plains, NY: Pearson Education, Inc.
Brown, H., & Lee, H. (2015b). Techniques, textbooks, and materials. In Teaching by principles: An interactive approach to language pedagogy (4th ed.). (pp. 219-36). White Plains, NY: Pearson Education, Inc.
Cassady, J., & Gridley, B. (2005). The effects of online formative and summative assessment on test anxiety and performance. Journal of Technology, Learning, and Assessment, 4(1), 4-31. Cheng, Y., Horwitz, E., & Schallert, D. (1999). 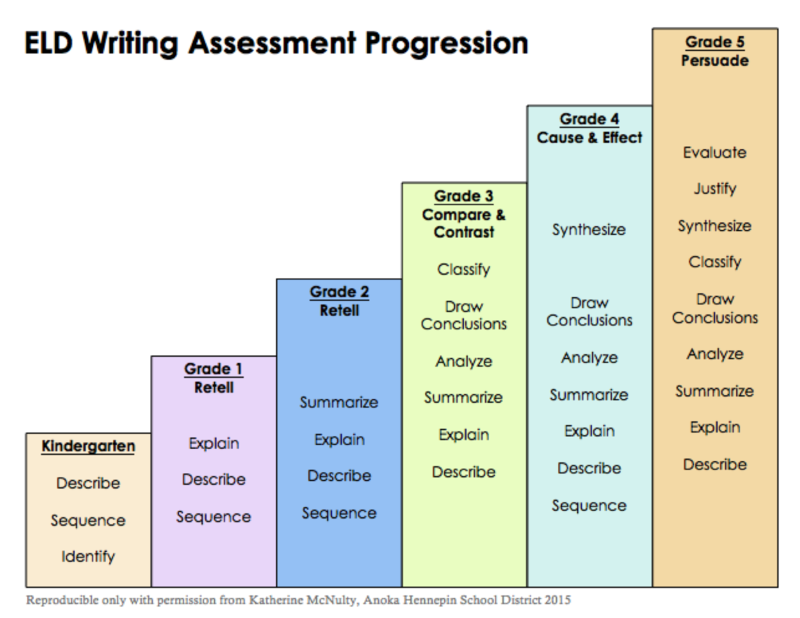 Language anxiety: Differentiating writing and speaking components. Language Learning, 49(3), 417-46. Harris, M. (1997). Self-assessment of language learning in formal settings. ELT Journal, 51(1), 12-20. Horwitz, E. (2001). Language anxiety and achievement. Annual Review of Applied Linguistics, 21(1), 112-26. Horwitz, E., Horwitz, M., & Cope, J. (1986). Foreign language classroom anxiety. The Modern Language Journal, 70(2), 125-32. Lindenau, S. (1987). Issues and answers in foreign language proficiency. In H. Seliger & M. Long (Eds.) Classroom-orientated research in second language acquisition. Rowley, MA: Newbury House. MacIntyre, P., & Gardner, R. (1994). The subtle effects of language anxiety on cognitive processing in the second language. Language Learning, 44(2), 283-305. MacIntyre, P., Noels, K., & Clément, R. (1997). Biases in self-ratings of second language proficiency: The role of language anxiety. Language Learning, 47(2), 265-87. Phillips, E. (1989). Anxiety and speaking in the foreign language classroom. Texas Papers in Foreign Language Education, 1(1), 191-206. Phillips, E. (1992). The effects of language anxiety on students’ oral test performance and attitudes. The Modern Language Journal, 76(1), 14-26. Scott, M. (1986). Student affective reactions to oral language tests. Language Testing, 3(1), 99-118. Sellers, V. (2000). Anxiety and reading comprehension in Spanish as a foreign language. Foreign Language Annals, 33(5), 512-20. Tobias, S. (1980). Anxiety and instruction. In I. Sarason (Ed.) Test anxiety: Theory, research, and applications. Hillsdale, NJ: Erlbaum. Woodrow, L. (2006). Anxiety and speaking English as a second language. RELC Journal, 37(3), 308-28. “Be Your Dream” academic coaching is a research-based approach to helping students develop a growth mind-set, set and achieve personal and academic goals, and create an identity as confident, self-directed learners. 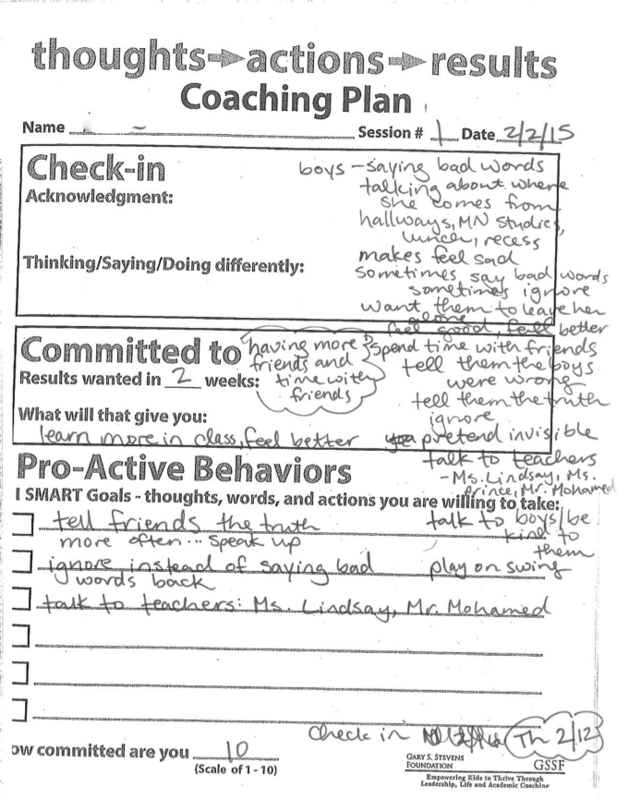 This article presents a case study of academic coaching in a sixth-grade ESL setting. Middle School ESL: What are the challenges? During the 2014-2015 school year, I taught sixth grade ESL in an urban setting at a school that serves approximately 750 students from preschool – grade 8. Fifty-nine percent of the students were English Language Learners, mostly from East Africa; ninety-three percent of students received free or reduced-price lunch. My students crossed multiple cultural, linguistic, and socioeconomic borders every day. They were constantly navigating a complex set of challenges and thresholds. In addition, they were emerging adolescents in a country and culture that was unfamiliar to them to varying degrees. Students might have been more likely to struggle personally or socially if they also had a history of trauma (Halcón, Robertson, Savik, Johnson, Spring, Butcher, Westermeyer & Jaranson, 2004). And regardless of how recently they had immigrated, very few had a sufficient command of academic English to provide them with success at school. Having previously worked with high school and college students, adapting my practice to serve emerging adolescents was a challenge. As recognized in a 2002 position paper on how to best support students in their transition to middle school, adopted by both the National Middle School Association and the National Association of Elementary School Principals, sixth grade in particular is a very challenging time academically for many students, as they enter secondary school and must meet more rigorous expectations with less support than in elementary school (Association for Middle Level Education [AMLE]). Many of my students found this transition to be very difficult, and I wasn’t sure how best to help them. They needed just the right balance of structure and routine, along with autonomy and opportunities to explore and develop their own identities as young people and as scholars, supported by positive relationships with peers and adults (Wentzel, 1998). Digging Deeper: What’s going on here, and what can we do about it? In an effort to learn more about my students’ feelings about school and their experiences, I administered a short survey to the sixth-graders in my co-taught science classes. The survey included questions similar to those on the Minnesota Student Survey (Minnesota Department of Education [MDE], Minnesota Department of Health, Minnesota Department of Human Services, and Minnesota Department of Public Safety, 2013) about relationships with adults and peers at school and students’ perceptions of safety. One question asked which adults students felt they could approach with problems at school. I was saddened but not surprised to see that more than ten percent of sixth graders did not feel a strong connection to any adults at our school. That single fact told me a great deal about students’ experiences in school and their sense of belonging. It helped to explain why students might not feel connected to their classes or might struggle academically. If they don’t feel connected or supported by adults, their buy-in to an academic system may be negatively affected. These findings matched trends observed on the Minnesota Student Survey, which found that while increasing numbers students have reported feeling that their teachers care about them since 2001, in 2013 “less than half of the students felt that their teachers cared very much or quite a bit” (MDE, et al., 2013, p. 8). In many one-to-one conversations with students, it became clear that along with an absence of supportive relationships, fear of “looking stupid” was at the root of many challenges that students faced. In our conversations, many young people expressed deep, underlying fear about their academic ability. I wondered how best to help students develop more confidence. It was at this time that I learned about a program called Be Your Dream Academic Coaching. The program was developed and taught by Nancy Hellander Pung, CEO of Design From Within Coaching and adjunct faculty at Hamline University. Be Your Dream is a comprehensive approach to academic coaching based on the International Coach Federation’s Core Coaching Competencies (“Core Competencies,” n.d.), as well as current research in neuroscience and educational psychology. It seemed like exactly the resource my students and I needed: a structure and framework for conversations that could help me build relationships with my students, provide them with a safe and supportive space, and encourage them to embrace their own potential and develop a greater sense of agency and capacity as young scholars. I signed up for the course immediately, eager to learn and build my own skills and thereby better serve the many students in my classroom. Research Review: We’re not alone. The struggles and concerns that my students and I identified in the classroom make a great deal of sense in the context of broader educational research. It is well established that a sense of belonging and connection is important for student academic motivation and achievement for middle school students, especially in sixth and seventh grade (Goodenow 1993, Wentzel 1998, AMLE 2002). This might be called a “belonging mindset” (Rattan, Savani, Chugh & Dweck 2015). In addition to the importance of belonging to a community and positive relationships in supporting students’ academic success, it is also clear that students’ core beliefs about their own ability also have a great deal to do with their success in school and their ability to rebound from setbacks. As Carol Dweck (2010) has amply documented, students with a “growth mind-set” outperform students with a “fixed mind-set” (p. 26). Dweck’s research also demonstrates that a growth mind-set can be taught to students, and that changing their mind-sets can help to motivate them to succeed. This research is essential not just for individual students, but in order to ensure more equitable educational opportunities to all students: “Teaching a growth mind-set seems to decrease or even close achievement gaps” (2010, p. 28). Given the vast challenges that many students face simply because of their socioeconomic and linguistic backgrounds – in a society that often sees their backgrounds as deficits – creating a safe environment for risk-taking that includes building strong, supportive relationship and teaching a growth mind-set seems to be not just a positive idea but an imperative. The Framework: What is “Be Your Dream” academic coaching? In the Be Your Dream course, I learned about the UP coaching framework. UP is an acronym for Unlimited Potential; instructor Nancy Hellander Pung emphasizes the importance of beginning with the assumption that our students’ potential to learn and achieve is unlimited. Beginning with the assumption of unlimited potential sets a positive, affirming tone for interactions with students. Challenging fixed mind-sets about ability and intelligence allows space to develop a growth mind-set, with belief in the potential and possibility inherent in every child. Communicating that belief and confidence in the possibility of growth and change is a key part of the academic coaching framework and it is one of the most important strategies I learned from this course. Other strategies taught in the course included a coaching framework that begins with asking students to identify their big dreams and goals for their lives. Identifying dreams and goals opens space for a conversation about students’ underlying values, which is a powerful tool for building student confidence and reinforcing a positive and affirming sense of identity. Once students identify their dreams, goals, and core values, the coaching framework helps students walk through the steps they’ll need to take to reach their goals, identifying specific and actionable steps, and brainstorming ways to overcome potential barriers. The framework is always focused on empowering students to create their own plans and build accountability systems, with support from the coach. The coach also helps students identify their thoughts and beliefs, which lead to actions and ultimately results. A powerful aspect of the coaching framework is helping students to find ways to consciously adjust their thoughts, beliefs, and actions in order to achieve the results they long to see in their lives (Hellander Pung 2014). Framework To Practice: How does it work in real life? I chose to formally practice academic coaching with one young person. A. was typical of many of my students. She arrived in late September 2014 with a WIDA score of 2.3. Within her first several weeks, she received a disciplinary referral for verbal fighting with other students. Her fall MAP reading score was 174, far below a passing score of 203, which would indicate grade-level proficiency in reading. Her first semester GPA was 2.5, with a D- in math. In our first coaching session, I began by introducing the coaching process and goals, and asked for A.’s permission to coach her. We talked about her goals and dreams for herself, and identified obstacles and challenges to meeting those goals. She then created a set of action steps she could take to begin to meet her goals. 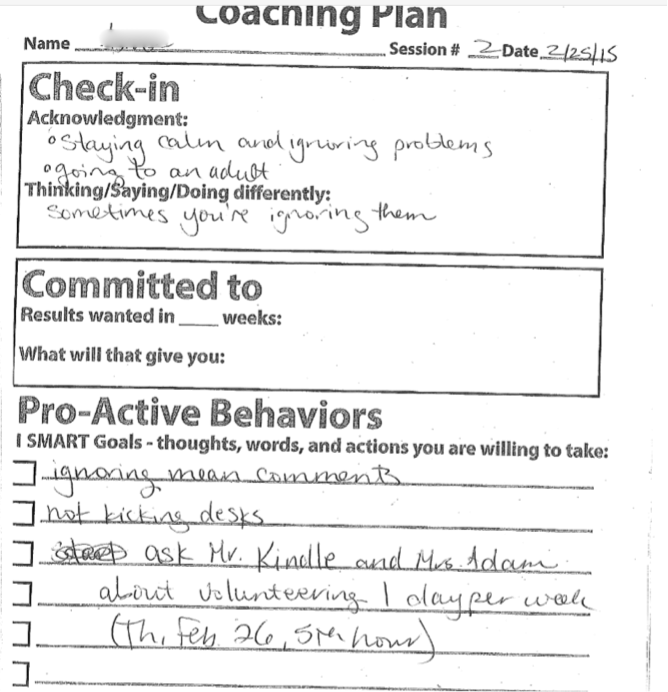 I used coaching forms created by Nancy Hellander Pung to guide and document our conversations, shown here in Figure 1, used with permission. In this first session, it is clear that A. was most concerned about her social interactions with other students. She was struggling to form friendships with other students, and several students were bullying her. She said this made her feel sad, and sometimes she said bad words back to them, which made her feel worse. Her only other strategy was to “pretend to be invisible,” which also made her feel sad and lonely. The goal that A. created in this first session was to have more friends and more time with her friends. Her motivation for meeting this goal was to feel better and to learn more in class, rather than being distracted by bullying. 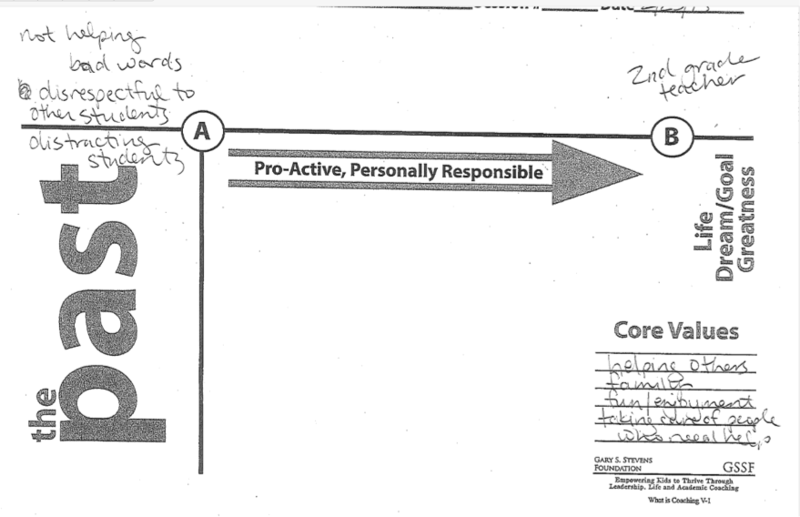 The steps to reach this goal that she identified included telling teachers when bullying was happening, speaking up and being honest with the girls who were her friends rather than pretending to be invisible, and working hard to ignore mean comments rather than responding aggressively herself. On a scale from one to ten, she rated her commitment to this plan at a ten, and we agreed to check in about a week and a half later. In our second session, which is documented in Figure 2, I began by acknowledging the progress that A. had made toward her goal. (Click on the image to make it bigger.) She was focusing on ignoring negative comments and going to an adult rather than taking matters into her own hands when she had conflicts with students. Using those strategies was helping her to stay calm and have fewer negative interactions with others. In reflecting on how her own thoughts and actions had changed, A. recognized that although it continued to be challenging, sometimes she was successfully ignoring students who bothered her. We then talked about A.’s “big dream” for her life, using the template shown in figure 3. (Click on the image to make it bigger.) It was in this conversation that I learned about A.’s dream of becoming a second-grade teacher. She talked about playing school and teaching her younger siblings at home, and how much she enjoyed working with children and helping them learn. This moment felt like a break-through. We opened up beyond the immediate issues facing her in sixth grade, and started to find ways to identify her core values and connect her daily actions to the bigger dream she had for her own life. This was a powerful conversation because it helped both A. and me to understand more about her underlying values and goals, and helped both of us to find more connections between her day-to-day life at school and her own big dream for her future. This allowed her to have a different perspective on her social and academic experiences. Our initial conversation had been very narrow in scope: She was upset about bullying and felt that she had very few strategies to address it. When she had a few immediate strategies to address it in the moment – talking to an adult and doing her best to ignore rather than retaliate – she was able to take a step back and find more long-term strategies that were connected to more of her whole self, grounded in her own values and dreams. Noticing the Change: How do we recognize growth? In our third formal session, A. and I had a completely different conversation than the first time we talked. It had been about eight weeks, and in contrast to our first talk about bullying, wanting friends, and pretending to be invisible, during this coaching session A. focused on her volunteering in a fifth-grade classroom, how she felt she was building skills that would help her be a teacher one day, and how she was becoming more responsible and serving as a role model for others. When she set her goals, she focused on paying attention in class, completing work, and checking her grades. This shift toward an academic focus indicated to me that many of the steps she was taking were helping her to find her place and sense of belonging, which then allowed her to focus more on learning and scholarship in the classroom. This positive shift continued throughout the spring. There were several other indicators of the ways her engagement with school changed. Her Measures of Academic Progress (MAP) reading score increased eight points from 174 to 182, still below grade level but indicating growth. Her WIDA English proficiency score increased from 2.3 to 3.8, a huge amount of growth in her academic language skills. She had no more disciplinary referrals, and her grade point average increased from 2.5 to 2.875, with a B- in math. Practice into Praxis: What has changed for me? It was inspiring and affirming to confirm the improvement in A.’s grades and test scores, as well as to see the ways that her self-confidence and belief in her own self-efficacy changed throughout the coaching process. As an educator, my goal is always to ensure that my instruction is relevant, engaging, and meaningful to students. There were many ways in which I was already working to meet that goal, and the UP coaching framework has given me more tools to do that. Based on what I learned throughout this experience, I will strive to always be conscious of the dreams and goals that students have for themselves. I will look for the deeper intention behind students’ goals and desires and listen for their core values. I will focus check-in conversations on concrete, actionable steps that help students get measurably closer to their goals, check their level of commitment, and help them to build networks of support and accountability. Finally, I’m reminded that our students are brilliant young people who are the experts on their own experience and who very often know exactly what they need. They have dreams and goals; they need adults to support and nurture them, but they don’t need adults to define them. My goal as a teacher and coach is to create spaces where students can “step into their big dreams,” in the words of Nancy Hellander Pung (2014), and to “hear students into speech,” in the words of Parker Palmer (2007). The insights I’ve gleaned from this course have further strengthened my belief in the capacity and unlimited potential of all young adults, and deepened my appreciation for the opportunities I have to share the journey with them however I can. Association for Middle Level Education. (2002). Supporting students in their transition to middle school. Retrieved from http://www.nppsd.org/vimages/shared/vnews/stories/-525d81ba96ee9/Tr%20%20Supporting%20Students%20in%20Their%20Transition%20to%20Middle%20School.pdf. Core competencies. (n.d.) In International Coaching Federation. Retrieved from https://www.coachfederation.org/credential/landing.cfmItemNumber=2206&navItemNumber=576. Cummins, J. (2001). Negotiating identities: Education for empowerment in a diverse society (2nd ed.). Los Angeles: California Association for Bilingual Education. Dweck, C. (2010). Mind-sets and equitable education. Principal Leadership, 10(5), 26-29. Halcón, L., Robertson, C., Savik, K., Johnson, D., Spring, M., Butcher, J., Westermeyer, J., & Jaranson, J. (2004). Trauma and coping in Somali and Oromo refugee youth. Journal of Adolescent Health, 35(1), 17-25. Hellander Pung, N. (2014). Be your dream: leadership and academic coaching skills (presentation slides). Presented in MPS ProPay Course #90691, Winter 2014. Minnesota Department of Education, Minnesota Department of Health, Minnesota Department of Human Services, and Minnesota Department of Public Safety. (2013). Minnesota student survey 1992-2013 trends. Palmer, P. J. (2007). The courage to teach: Exploring the inner landscape of a teacher’s life. San Francisco: Jossey Bass. Rattan, A., Savani, K., Chugh, D., and Dweck. C. (2015). Leveraging mindsets to promote academic achievement: Policy recommendations. Perspectives on Psychological Science, 10(6), 721-726. Snyder, C. R. (Ed); Lopez, Shane J. (Ed), (2002). Handbook of positive psychology. New York, NY: Oxford University Press. Wentzel, K. (1998). Social relationships and motivation in middle school: The role of parents, teachers, and peers. Journal of Educational Psychology, 90(2), 202-209. English learners are a diverse group entering our schools with a wide range of backgrounds and needs. Many readily develop the necessary language skills and content knowledge, and progress satisfactorily. But others struggle and school presents major challenges. 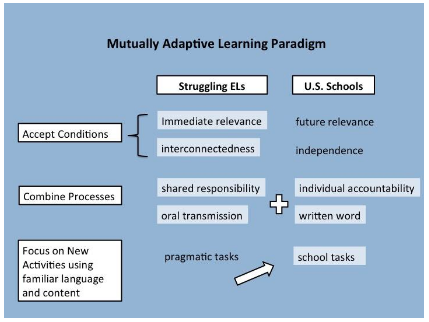 I describe the Mutually Adaptive Learning Paradigm (MALP®), a culturally responsive approach that builds bridges to formal education for these struggling learners. What do you first see when you look at this image? 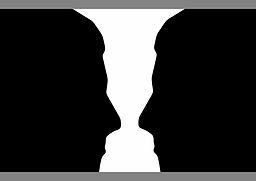 Some people say “a candlestick.” Others see the silhouettes of two heads. Is there a “wrong” or “right” answer; is there only one answer? No to both questions. This image is an optical illusion, that is, a drawing presenting an image that can be perceived in different ways. What you initially perceived as “the image” is just one possibility. I begin my discussion with this optical illusion to illustrate that there is not just a single way to understand the world around us, only one “reality.” As with this optical illusion, educators and their students may each see the world in very different ways, based on their significantly different prior learning experiences. This is especially true for struggling English Learners (ELs) who for whatever reason have not fully participated in formal education and have developed ways of thinking and understanding that are anchored in real-world experiences. We, as educators, in contrast, anchor our ways of thinking and understanding the world in formal education. To best address the needs of these students, we must become aware of cultural factors underlying these two different perspectives. Once we develop such an understanding, we are in a position to design and implement instruction that builds bridges to learning in our classrooms. 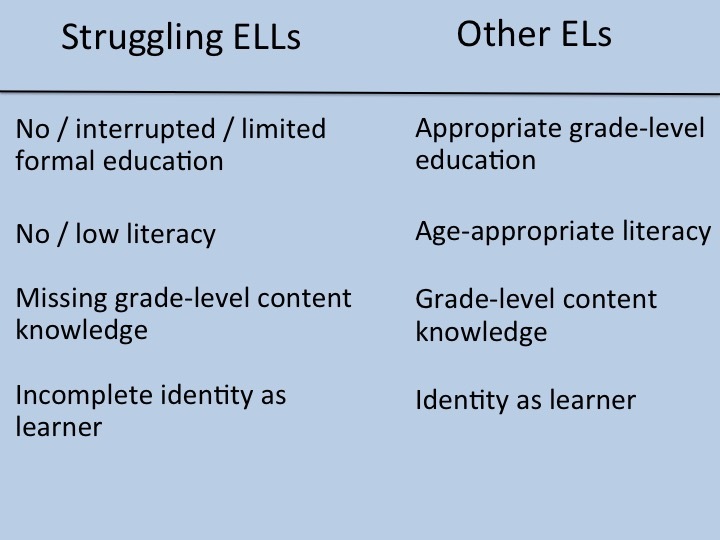 Evident so far in this discussion has been an emphasis on what struggling ELs lack. Such an emphasis is very much a deficit view, and one that, unfortunately, is the prevailing view today. But I now ask, how appropriate is such a deficit view? If we measure struggling learners through the lens of formal education, then yes, they are lacking. But what if we recognize that their “reality” is distinct, that their ways of thinking and perspectives on learning, derived from their prior culturally based learning experiences, are different rather than deficient? Doing so invites a very different conversation. An essential portion of this alternative conversation about struggling ELs is the incorporation of culturally responsive teaching (Gay, 2010) into our classrooms. Culturally responsive teaching requires a deep exploration of culture going far beyond the “heroes, holidays, and food” approach (DeCapua & Wintergerst, 2016; Ngo, 2010). A deep understanding of culture allows us to draw on and honor the prior experiences and current knowledge of struggling ELs, experiences and knowledge that may not be (and in most cases are not) school-based ways of thinking and school knowledge. At the same time, we must facilitate the development of their identities as learners that align with our formal educational paradigm. essential features of informal ways of learning and formal education. First, for struggling ELs, their preferred mode for accessing and transmitting information is through oral means rather than through written means. Even when they have basic literacy skills, they are still more comfortable exchanging information and knowledge orally. In our educational system, strong literacy skills are fundamental. Academic success hinges on participatory reading and writing skills, a form of literacy demanding much more than decoding skills (Suárez-Orozco, et al., 2013). Second, most struggling ELs come from collectivistic (sub)cultures that highly prize interdependence and the interconnectivity of the group. People regard themselves as an inseparable part of a web of relationships, the maintenance of which is central to behaviors and actions. U.S. mainstream culture, in contrast, is a highly individualistic culture that values independence, and the pursuit of individual wants and preferences (Hofstede, 2000; Triandis, 1995). Our educational system reflects and fosters these values by lauding independent work and requiring individual assessment. And third, informal learning and formal education promote the development of different types of cognitive pathways, given divergent sociocultural processes for learning and teaching, and the types of activities for supporting the development of knowledge and skills (Gavin, Beebe, and Zhao, 2011). Struggling ELs, whose dominant learning has been through informal ways, have experienced learning within their web of relationships and as part of the sociocultural practices of their communities and families (Rogoff, 2014). Learning is rooted in the here and now, with tasks that are concrete, pragmatic, and immediately relevant. Learning to cook, farm, peddle, or any of the myriad sociocultural practices of daily life do not require literacy, prescribed curricula, or tasks removed from every day experience. Formal education, on the other hand, is set apart from daily life and is future-oriented, preparing students for life after school. Formal education is literacy-based with fixed curricula, and designed to impart knowledge that has been separated into discrete disciplines and to develop school-based, academic ways of thinking. Students practice and demonstrate mastery of knowledge through decontextualized tasks. To take one example, the most common question asked in classrooms is to define something, as in “What is _____?” (Cazden, 2001) or What is a snake? A correct definition entails students identifying the characteristics that make a snake different from, say, an alligator. Defining draws on abstract characteristics that reflect school-based ways of thinking and organizing knowledge (Flynn, 2007). Struggling learners find a task such as this strange. In the real world a snake may be characterized as something poisonous or not, but one does not walk around saying a snake is a “limbless, scaly, elongate reptile” (dictionary.com). And, while learners may produce a definition along the lines of “an animal with no legs or arms,” this does not follow the prescribed format of formal definitions. It is this third major underlying difference—the types of thinking and tasks reflecting thinking in informal ways of learning versus formal education—that is the hardest for us to recognize and comprehend. As educators, our daily thinking, both inside and outside of school, has been shaped by school-based ways of thinking, making it difficult to see the other “image” or reality. This discussion of three crucial underlying cultural differences leads us to the question of how to help struggling ELs succeed in our educational system. Successfully making the transition to classroom success demands that learners are able to access and transmit information via the written word rather than orally; engage in expected classroom behaviors and academic discourse; and become active participants in a learning process based on literacy and decontextualized tasks for building and demonstrating content knowledge. Initially, two options occur to accomplish this goal. For one, educators may choose to teach struggling ELs in the ways with which they are most comfortable, namely focusing on the concrete and familiar, and incorporating conventional basic literacy development. While this approach may make struggling ELs successful in a particular classroom, it does not move them towards school success. They are not receiving academic second language instruction in content areas and not necessarily developing school-based ways of thinking and modes of discourse. Other educators may take the approach that current pedagogical practices are sufficient and that it is the responsibility of struggling ELs to catch up and keep up. This will work for some students, particularly if they have a great deal of support, personal motivation, and aptitude, but does not work for the majority as evident in high disengagement and drop out rates in this population (Sheng, Sheng, & Anderson, 2011; Suárez-Orozco et. al., 2013). Neither approach truly addresses the needs of the majority of struggling ELs. There is, however, a third option, one that creates a bridge to success for struggling ELs. To build this bridge between the learning paradigm of struggling ELS and that of our educational system, culturally responsive teaching must be central. An approach that is in line with having a conversation that acknowledges different perspectives is the Mutually Adaptive Learning Paradigm or MALP® (DeCapua & Marshall, 2011; Marshall, 1998; Marshall & DeCapua, 2013). MALP® is a culturally responsive approach that redirects the conversation away from a focus on deficit and remedial to one on different and preparatory. MALP® prepares struggling ELs to participate in formal education while honoring their prior knowledge and experiences. MALP® is mutually adaptive because both educators and struggling learners are called upon to make shifts in their paradigm or their realities. How does MALP® work? To understand MALP®, we must think of learning as consisting of three separate but related components: conditions, processes, and activities (DeCapua & Marshall, 2011; Marshall, 1998; Marshall & DeCapua, 2013). Each component consists of two elements, for a total of six elements (see Figure 2. Click on the image to make it larger.). These are important for struggling ELs and must be present before the learning can take place. Struggling ELs come from backgrounds of informal ways of learning. Since most of their learning has taken place outside of formal classrooms, their prior learning experiences have been closely tied to the real world, to the pragmatic, and to concrete tasks with immediately relevant results. The majority of struggling ELs also come from collectivistic (sub)cultures and are accustomed to working together with others. In implementing MALP®, we need to ask ourselves: Does my pedagogy consistently incorporate material of immediate relevance along with subject matter knowledge? 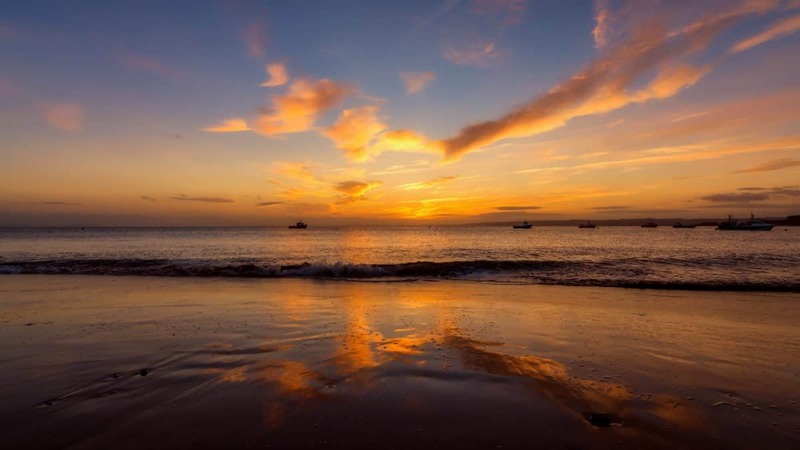 Is my classroom climate a warm, encouraging, and challenging environment that fosters a sense of interconnectedness, that is, being part of a classroom and school web of learning relationships? These are questions that must be affirmatively answered under the MALP® instructional model. Yet immediate relevance and interconnectedness are two elements not commonly evident in most formal classrooms beyond the very early years of schooling (Paris, 2012). Formal educational is not situated in daily life and practices, but is apart from these, and, the development and/or maintenance of webs of relationships, if they exist, are not seen as central but as auxiliary, and are usually found outside of the curriculum as in sports teams or clubs. Learning in formal education is future-based, predicated on the notion of discrete subject areas and content knowledge (Robinson, 2011). It is learning removed from the real world, where schooling takes place before “life,” where students are expected to be independent learners. Thus, we must consciously ensure that immediate relevance and interconnectedness are evident in our classrooms. These are how people prefer to access and transmit information. Struggling ELs prefer oral transmission; formal education is grounded in literacy. Struggling ELs are accustomed to shared responsibility; formal education demands individual accountability, particularly on assessments. The preference for oral transmission makes the centrality of literacy in our classrooms difficult for struggling ELs. Their familiarity with sharing responsibility, i.e. working together with others to accomplish tasks, makes the emphasis on individual accountability seem peculiar. And, in our educational system, even when group learning is encouraged, individual accountability remains the norm (Weimar, 2013). To transition struggling learners to literacy and individual accountability— essential processes of formal education— we combine them with oral transmission and shared responsibility, the two processes preferred by struggling learners. In combining the oral and the written, we avoid thinking in terms of listening, speaking, reading and writing as four discrete skill sets. Instead, we see speaking and listening as integral supports for literacy, and use strategies and techniques developed specifically for literacy development. In combining shared responsibility with individual accountability, we provide opportunities for learners to work together that also include sections or pieces requiring learners to work individually. Key is ensuring that the individual accountability piece does not only take place during assessments, but also while learners are sharing responsibility in a learning task. 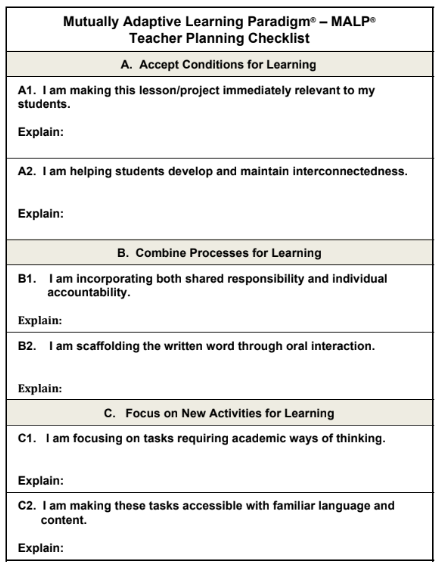 These are the tasks that learners perform to build and demonstrate mastery. These tasks differ greatly in informal ways of learning and in formal education. Weaving a piece of cloth or selling items in the market require pragmatic, concrete tasks that produce immediate tangible results. In formal education, tasks are decontextualized, found primarily in school rather than outside of the school setting, such as the earlier definition question, What is ____? To transition struggling ELs to thinking in school ways and being able to engage in decontextualized tasks, we provide opportunities for them to become familiar first with school ways of thinking and practice school tasks before new language and content are introduced. By starting with familiar language and content, struggling ELs can focus on the task itself, without the additional difficulties posed by new language and content. Once they are familiar with school-based ways of thinking and the new task, then we introduce new language and content. By implementing MALP® and changing the conversation to one of difference rather than one of deficit, we can effectively transition struggling ELs to our classrooms. (See Figure 2. Click on the image to make it larger.) We are explicitly addressing the mismatch between their ways of thinking and those expected and assumed in our classrooms while we continue to acknowledge and honor what they do bring. MALP® also does not ask educators to ignore or discard pedagogical practices that they know work well with struggling ELs. What MALP® does do is provide a framework to help educators conceptualize what works, what doesn’t, and what they still need to incorporate into the classroom and their teaching (DeCapua & Marshall, 2011; Marshall, 1998; Marshall & DeCapua, 2013). Fully implementing MALP® builds bridges that allow struggling ELs to access formal education. And to assist in doing so, educators use the MALP® Teacher Planning Checklist, reproduced here and available at malpeducation.com. The Checklist mirrors the MALP instructional model as seen in Figure 2. (See Figure 3 for the Checklist. Click on the image to make it larger.) Using the Checklist in preparing and reflecting on lessons provides teachers with a tool for evaluating whether and how well they are incorporating the six elements of MALP. It is essential that all six elements of the three components are included, perhaps not in a single lesson, but in a series of lessons or in a unit because all the elements work in tandem. The Checklist is also a valuable tool when conducting classroom observations. Although we are all human beings, culture and prior learning experiences shape how we perceive and understand the world around us. Our reality as products and active transmitters of formal education is a different reality than that of struggling ELs. By implementing culturally responsive teaching using the MALP® instructional model, we can more effectively transition struggling ELs to a new and different reality, one in which they see themselves as successful learners in a learning paradigm centered on literacy, school-based ways of thinking, academic discourse, and decontextualized tasks. You can find more information on MALP at malpeducation.com. Anderson-Levitt, K. (2003). Local meanings, global schooling. Hampshire: Palgrave. Cazden, C. (2001). Classroom discourse: The language of teaching and learning. (2nd ed.). Portsmouth, NH: Heinemann. Cole, M. 2005. Cultural and historical perspectives on the developmental consequences of education. Human Development, 48, 195–216. DeCapua, A., & Marshall, H.W. (2011). Breaking new ground: Teaching students with limited or interrupted formal education. Ann Arbor: University of Michigan Press. DeCapua, A., & Wintergerst, A. (2016). Crossing cultures in the language classroom. Ann Arbor: University of Michigan Press. Flynn, J. (2007). What is intelligence? New York: Cambridge University Press. Gavin, M., Beebe, H., and Zhao, S. (2011). Applying the cultural approach to cognitive development. Journal of Cognition and Development, 12, 37–41. Gay, G. 2010. Culturally responsive teaching: Theory, research, and practice. (2nd ed.). New York: Teachers College Press. Hofstede, G. (2000). Culture’s consequences: Comparing values, behaviors, institutions and organizations across nations. (2nd ed.). Thousand Oaks, CA: Sage. Marshall, H. W. (1998). A mutually adaptive learning paradigm (MALP) for Hmong students. Cultural Circles, 3, 134-141. Marshall, H.W., & DeCapua, A. (2013). Making the transition to classroom success: Culturally responsive teaching for struggling language learners. Ann Arbor: University of Michigan Press. Ngo, B. (2010). Doing “diversity” at Dynamic High: Problems and possibilities of multicultural education in practice. Education and Urban Society, 42, 473–495. Paris, D. (2012). Culturally sustaining pedagogy: A needed change in stance, terminology, and practice. Educational Researcher, 41, 93–97. Robinson, K. 2011. Out of our minds: Learning to be creative. New York: John Wiley and Sons. Sheng, Z., Sheng, Y., and Anderson, C. 2011. Dropping out of school among ELL students: Implications to schools and teacher education. Journal of Educational Strategies Issues, and Ideas, 84, 98-103. Suárez-Orozco, C., Martin, M., Alexander, M., Dance, L.J., & Lunnebald, J. (2013). Promising practices: Preparing children of immigrants in New York and Sweden. In: R. Alba, R., & J.Holdaway. (eds.). The children of immigrants at school: A comparative look at integration in the United States and Western Europe. (pp. 204-252). New York: New York University Press. Triandis, H. (1995). Individualism & collectivism. Boulder, CO: Westview Press. Weimar, M. 2013. Learner-centered teaching: Five key changes to practice. (2nd ed.). San Francisco: Jossey-Bass. How do educators prepare elementary classroom teachers to support culturally and linguistically diverse students in their classrooms? Is our teacher education program doing enough? We investigated these questions through our research of elementary pre-service teachers’ written reflections. In this study, we investigated 23 pre-service teachers’ (mis)representation of emergent bilinguals in their written reflections. We used reflective practice (Schön, 1983, 1987) and instructional needs of emergent bilinguals (Zwiers 2007, 2009, 2014) to ground our study in order to understand the varied ways emergent bilinguals were perceived and characterized in elementary pre-service teachers’ written reflections. Schön suggested that reflective practice refers to teachers intentionally thinking about specific aspects of pedagogical practice that will lead to professional change and growth (1987). Zwiers and Crawford (2009) mentioned that the primary instructional need of emergent bilinguals is accelerated language development. Given accelerated language development will assist emergent bilingual students to share their ideas, support their ideas with evidence, and create new knowledge with other students. One of the main goals of our teacher education program is for pre-service teachers to consider their beliefs, reflect on their teaching in the moment of teaching (Schön, 1983), and to think on their feet so that they can alter instructional decisions to meet the needs of all students. Schön refers to this as reflection-in-action. Engaging in this process requires pre-service teachers to become aware of their knowing-in–action. We agree with Schön, who suggested that only through reflection could teachers begin to understand their daily practices. García, Kleifgen & Falchi (2008) suggested that English language learners are emergent bilinguals, which means these children are able to function in their home language as well as in English, their new language in schools. Teacher education programs can help develop the knowledge base and skills for pre-service teachers to encourage appropriate teaching practices of emergent bilinguals. Institutional teacher education programs structure how the profession responds to processes of learning to teach (Freeman & Johnson, 1998). In our opinion, not all teacher education programs provide strong methods courses on how to accommodate and meet the needs of emergent bilinguals in a mainstream classroom. Teacher education programs can further facilitate language teaching and learning to better prepare pre-service teachers to work with emergent bilingual students. Freeman and Johnson (1998) write, “The knowledge-base of language teacher education needs to account for the teacher as a learner of teaching, the social context of schools and schooling within which teacher-learning and teaching occur, and the activities of both language teaching and language learning” (p. 397). Mixing emergent bilinguals with native English speakers in classrooms can pose pedagogical challenges for teachers; oftentimes teachers overlook the language needs of emergent bilinguals in their practices. The pre-service teachers in our study were provided with specific methods courses to support their content and pedagogy knowledge for working with emergent bilingual students. The purpose of our study was to investigate and analyze how elementary pre-service teachers are (mis)(re)presenting emergent bilinguals in their written reflections of teaching. Are pre-service teachers representing emergent bilinguals in their written reflections? To what degree are pre-service teachers conceiving of representing emergent bilinguals in an asset-based framework in their written reflections? It was our hope that the findings would encourage further research and discussions regarding ways to support pre-service teachers in recognizing the needs and assets of all learners, but especially emergent bilingual students, through their reflective practices. We situated our study in Dewey’s understanding of reflection, which states that one of the main goals of education is to help people acquire habits of reflection so that they can engage in intellectual thought and action, rather than routine thought and action (Dewey, 1933). Dewey was concerned with reflection and not being guided by routine thinking – this is our teacher education program’s concern with pre-service teachers’ written reflections. One of the goals of our teacher education program is for our pre-service teachers to question their beliefs about teaching emergent bilinguals and to examine where these beliefs originated in order to be more critical and reflective of their pedagogical practices. Since emergent bilinguals come to a classroom with diverse language abilities, pre-service teachers need to know how to reflect on and consider their teaching techniques when a variety of learning needs are present within their classroom. Dewey (1933) considered reflection as, “active, persistent, and careful consideration of any belief or supposed form of knowledge” (p.16). It is important for pre-service teachers to carefully consider their views about teaching emergent bilinguals. Scholars Darling-Hammond and Bransford (2005) echoed Dewey when they suggested reflection requires pre-service teachers to re-think previously held beliefs and be open to the possibility of re-examining one’s perspective. The authors think it is important to re-examine previously held beliefs so that teachers do not continue perpetuating potential injustices and inequalities. We also want pre-service teachers to reflect on their teaching in the moment of teaching (Schön, 1983), and to think on their feet so that they can alter instructional decisions to meet the needs of students. Schön (1983) refers to this as reflection-in-action. Engaging in this process requires pre-service teachers to become aware of their knowing-in–action, being aware of what is happening subconsciously. During reflection-in-action, pre-service teachers move beyond their routine ways of knowing (Dewey, 1933) and engage in dynamic on-the-spot teaching and learning, based on their reflection-in-the-moment when teaching and learning occurs. Our study also calls upon Jeff Zwiers’ work that highlights the academic language needs of emergent bilinguals in mainstream classrooms. An outcome of our program is for pre-service teachers to consider their own beliefs and not to overlook a learner in their practice because of a difference in culture or learning needs. We want our pre-service teachers to know that “English language learners (emergent bilinguals) need accelerated language development. This acceleration is fostered by experiences that allow them to share their thoughts, support them with evidence, and co-construct knowledge” (Zwiers & Crawford, 2009, pg. 73). This is one of our teacher education program’s goals for our pre-service teachers. Zwiers (2006, 2007, 2013) suggests that teachers need to give all students a variety of learning opportunities within each lesson and subject taught throughout the school day. Being able to understand the learning practices that took place through reflective practice is crucial to the pedagogical development of teachers and the success of students. Oftentimes students and teachers are unsure of how to use or implement “school language,” which is referred to as academic language (Zwiers, 2013, p. 1). Compounding this challenge is another problem, “…teachers do not value the knowledge and language skills that linguistically diverse students bring to class” (Zwiers, 2013, p. 11). Students come to school with a language in place and many times their abilities are not recognized in a classroom. A challenge for pre-service teachers is to recognize, assess, and implement instruction based on students’ diverse cultural and linguistic skills. In our teacher education courses, we encouraged pre-service teachers to engage in written reflections to examine the cultural and linguistic assets and provide meaningful instruction for emergent bilingual students. Participants in this study were 23 pre-service teachers at a large urban university in the Midwest. The participants were enrolled in a post-baccalaureate teaching licensure program. All participants were preparing to be elementary general education teachers. Teaching English Learners in the Elementary Classroom. These courses were taken while the students worked 400 hours in their placement classroom. The schedule was organized on a block format, alternating between two weeks on campus and two weeks at the field experience site with K-6 students. According to Minnesota Department of Education (2016), in 2015, an estimated 8,552 emergent bilingual students were identified in Minneapolis public schools with the majority falling in primary grades K-6. Minneapolis ranks the second highest for English learners in the state (Minnesota Department of Education, 2016). Since the pre-service teachers are in Minneapolis placements with high emergent bilingual populations, the two literacy courses were designed to advance students’ understanding and practical application of curricular and methodological issues in teaching reading and language arts for culturally and linguistically diverse classrooms. The English learner course was designed to give a solid knowledge of research-based pedagogy for emergent bilingual students. Pre-service teachers were assigned four literacy lessons to teach before full time student teaching. They reflected in writing on these four lessons, which they taught during their practicum experience. To what extent did the whole class or group learn what you intended them to learn? Cite specific examples and/or evidence. Who did the lesson work best for? What didn’t work and for whom? What did you learn about your students as learners? We conducted an inductive content analysis, wherein we identified the themes in pre-service teachers’ written reflections based on literature relating to reflection and reflective practice (Dewey, 1933; Schön, 1983) and the academic needs of emergent bilinguals (Zwiers, 2013). Written reflections were coded for patterns, categories and emerging themes (Lincoln, 1994; Saldana, 2008). We went through several iterations of reading and coding the data. Next, we read each other’s comments on each reflection and discussed these comments as a means of triangulation of data to ensure that we were garnering similar interpretations from the written reflections. The data showed that after 23 pre-service teachers taught a literacy lesson to K-6 students, 74% did not mention emergent bilinguals in their written reflections, even though they were teaching in classrooms that had emergent bilingual students. Of the percentage that mentioned emergent bilinguals in their written reflections, 40% referred to emergent bilinguals from a deficit perspective. Based on the literature pertaining to how emergent bilinguals are perceived in K-6 classrooms (Zwiers, 2013), we were not surprised to glean this information from the data. However, we were disturbed by our findings because we earnestly teach our pre-service teachers to develop an asset orientation towards emergent bilinguals (Moll, Neff, Amanti, & Gonzalez, 1992). The pre-service teachers were not teaching full-time in a classroom during this placement. The students were on a block schedule, where they were at their placement sites every two weeks to implement lessons. This may have impacted their comfort level and relationship with the students. We did not have follow-up conversations with the pre-service teachers due to the block schedule and limited time outside of the classroom. What we know as researchers/instructors comes from students’ written reflections. We were unable to ask clarifying follow-up questions of the participants. Lastly, given that 23 is a small sample size, results cannot be generalized to all pre-service teachers in university programs. This research was motivated by our desire to understand how our pre-service teachers perceived emergent bilinguals through their written reflections. Our pre-service teachers are taught a stand-alone English learner course and we wanted to identify that knowledge gained from this course was being applied to other courses and pedagogical practices. Our interest led to rich discussions as we collaboratively investigated how our pre-service teachers were (mis)(re)presenting emergent bilinguals in their written reflections. As a result of looking at these written reflections, we learned of the limited and varying ways our pre-service teachers perceived emergent bilinguals. how to (re)organize our elementary methods syllabi to allow for more co-teaching between the English learner and literacy methods instructors since the pre-service teachers are in placements that require co-teaching. Being able to see and experience co-teaching taking place in their methods courses could help encourage and provide insights for their own teaching with students. Although further research is needed, the findings from this study indicate that emergent bilinguals were minimally represented in pre-service teachers’ written reflections. Our pre-service teachers were taught to respond to groups of students in their methods courses. Exemplar written reflections were provided for our pre-service teachers to gain understanding and knowledge of how to reflect on teaching before going to their placements to implement lessons. Although our findings represent pre-service teachers’ written reflections from only one semester, we cautiously offer four recommendations. Teacher education programs need to offer more courses designed specifically for elementary mainstream teachers about English learners. The enactment of these recommendations would likely move pre-service teachers to include more emergent bilinguals in their written reflections and develop stronger, well-prepared teachers. Dewey, J. (1933). How we think. Boston: D.C. Heath. Dewey, J. (1938). Experience and education, (6th ed.). New York: Macmillan. Freeman, D., & Johnson, K. E. (1998). Reconceptualizing the knowledge-base of language teacher education. Tesol Quarterly, 397-417. García, O., Kleifgen, J. A., & Falchi, L. (2008). From English Language Learners to Emergent Bilinguals. Equity Matters. Research Review No. 1. Campaign for Educational Equity, Teachers College, Columbia University. Moll, L. C., Amanti, C., Neff, D., & Gonzalez, N. (1992). Funds of knowledge for teaching: Using a qualitative approach to connect homes and classrooms. Theory into Practice, 31(2) 132-141. Schön, D.A. (1987). Educating the reflective practitioner: Toward a new design for teaching and learning in the professions. San Francisco: Jossey-Bass. Zwiers, J. (2006). Integrating academic language, thinking, and content: Learning scaffolds for non-native speakers in the middle grades. Journal of English for Academic Purposes, 5(4), 317-332. Zwiers, J. (2007). Teacher practices and perspectives for developing academic language. International journal of applied linguistics, 17(1), 93-116. Zwiers, J. (2013). Building academic language: Essential practices for content classrooms, grades 5-12. John Wiley & Sons. Zwiers, J., & Crawford, M. (2009). How to start academic conversations. Educational Leadership, 66(7), 70-73. Zwiers, J., O’Hara, S., & Pritchard, R. (2014). Common core standards in diverse classrooms: essential practices for developing academic language and disciplinary literacy. Stenhouse Publishers.